JuJu Smith-Schuster began Week 16 with a promise to tough it out for all those fantasy football owners trying to win their league championships. He ended it with an apology for a mistake that might have wrecked Pittsburgh's playoff plans. Limited at practice all week by a sore groin, Smith-Schuster tweeted before the Steelers' showdown at New Orleans that he wouldn't miss the game for anything. "A lot on the line this week. The whole season comes down to this," Smith-Schuster tweeted. "I'm talking about the fantasy football championship round. Of course I'm playing Sunday!! There's no way I can let down the real ones who believed in me by drafting me!! Let's get it!!" Smith-Schuster delivered 11 receptions for 115 yards. But he let down Steelers Nation with his fumble at the New Orleans 34 in the final minute, sealing Pittsburgh's 31-28 loss . "When I'm at my lowest, I'm not going to hide," Smith-Schuster wrote in an Instagram post Monday. "I'm sorry. That loss was on me. I let everyone down, it won't happen again." Smith-Schuster wasn't the only one in the spotlight of blame and blunders. 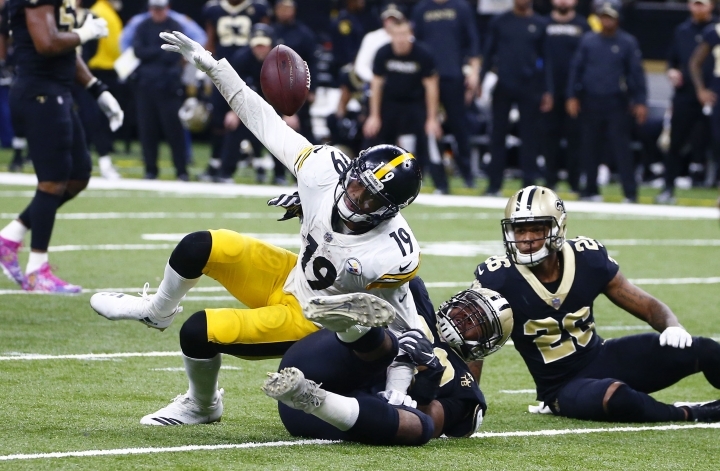 His coach, Mike Tomlin, is being second-guessed for a failed fake punt that set up the Saints on Pittsburgh's side of the field for the game-winning touchdown drive with less than five minutes left in the fourth quarter. "I just wanted to be aggressive," Tomlin said after the Steelers fell from fourth to eighth in the AFC playoff picture thanks to two fumbles and the failed punt on their last three possessions. Upback Roosevelt Nix took the snap, stepped to his right and ran up the middle. He was stopped just shy of first down, although he celebrated as though he'd fooled the Saints. "I didn't even know it was coming," quarterback Ben Roethlisberger said of the fake punt. The same couldn't be said for the Saints (13-2), who captured the NFC's top seed for just the second time in their history. They parlayed the No. 1 seed in 2009 into their only Super Bowl championship. Despite their 38-31 loss to the Seahawks on Sunday night, the Chiefs (11-4) can capture the AFC's No. 1 seed with a win over Oakland next week. Hunt's signed notorious ketchup lover Patrick Mahomes as its brand ambassador after learning one of the QB's culinary passions is the red condiment he puts on everything from steak to mac & cheese. "I've been a fan of ketchup for as long as I can remember, and the thick, rich flavor of Hunt's ketchup delivers every time," Mahomes said — or at least he read that advertising copy that was written for him. Other key decisions in Week 16 included Raiders punt returner Dwyane Harris scooping up the loose ball at Oakland's 1-yard line Monday night and returning it 99 yards for a touchdown on a muddy field in one of the most spectacular plays of the season. It tied for the second-longest punt return in NFL history. And the New England Patriots sent a shout-out to Nick Foles , of all people, after the Eagles backup QB — who outdueled Tom Brady to secure Philadelphia's Super Bowl win last season — did them a huge favor. The Patriots, who have won their division 16 times in the 18 years Brady has started for them, haven't had to play a wild-card game since 2009. And their five championships each followed a first-round playoff bye like the one they're in line for following the Texans' loss. So, the Patriots tweeted, "We never thought we'd say this in 2018, but ... Thanks Nick Foles!"